This issue comes with extensive behat tests. 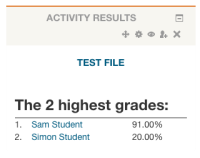 Currently moodle supports high scores from modules in multiple ways. Quiz uses the block_quiz_results and lesson has a broken custom implementation. Rather than implement a new module specific solution for lesson, it was suggested in https://moodle.org/mod/forum/discuss.php?d=278186 that a generic solution that could be applied to any graded module should be developed. This issue proposes to implement a block similar to quiz_results that can be used by any module. MDL-51905 Activity results block configuration doesn't select default activity id.